Staff Selection Commission was scheduled to organize Common Graduate Level 2016 on 08 and 22 May 2016. But here is the latest update. 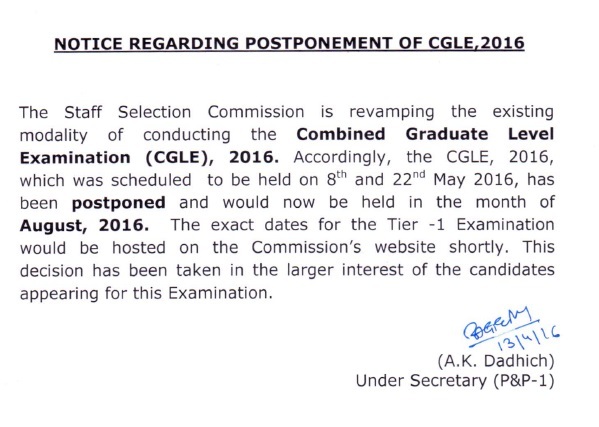 SSC had postponed Common Graduate Level (CGL) Tier 1 examination. Also the new revised dates had been announced. The test will be held in August 2016. Exact dates are going to be announced shortly. It is likely that SSC CGL 2016 Tier 1 will be held on any of the two dates among 07, 14, 21 or 28 August 2016 (any two sundays). 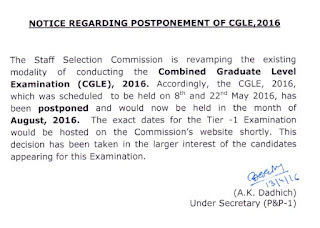 You can check the official notice regarding SSC CGL Postponement and New exam date from below.